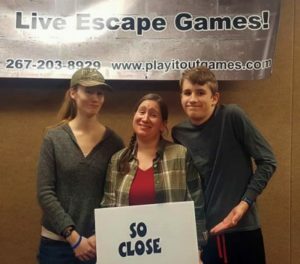 Have you visited Play It Out, our Souderton Escape Room yet? If not, what are you waiting for? 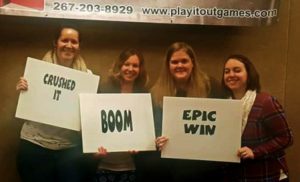 Our games are getting great reviews, and they won’t be around forever, so get your group together and book an escape at Play It Out. Have you ever thought about what a unique addition an escape room would be to your private party or corporate event? If so, give us a call today and book Our Portable Escape Room! The idea of a mobile escape room might conjure many different images in your mind. There are, in fact, escape room companies that are fully mobile, such as Mobile Escape Room in Chicago. Their large trailer is a sight to behold. At Play It Out, we like the cozy home base of our Souderton location. 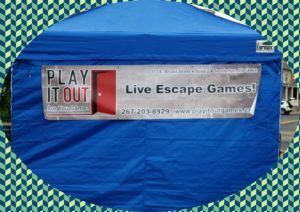 But since we love sharing the excitement and fun of escape rooms with everyone we meet, we’ve developed a 15 minute game to be played in a 10’x10′ tent, and we travel all over the Philadelphia region with it! Players have been raving about Bug Out Bunker at festivals, fundraisers, community nights, and private events since last summer. In this 15 minute game designed for up to 6 players, you’ll feel the pressure to work as a team, be creative, and move fast to accomplish your goal in time. Enthusiasts have used this game to introduce skeptics to escape room fun, and we always turn them into fans. Families love to bring in the younger kids that would never last an hour, and we love watching a family play together. Teens play to hone their skills and increase their chances of escaping in time at their next big game. When you book Bug Out Bunker for your private event, your guests will leave our game with adrenaline pumping, energized to engage in your other festivities. Hire us as a freebie at your festival, and treat your guests to a memorable and unique experience. Bring us to your corporate location for a break from the office with the added benefit of team building. Whatever kind of event you have in mind, we will help you to make it shine. Bug Out Bunker has a little fun with the doomsday prepper idea. Our country has been invaded, all systems are down, and laws are no longer in force. Your uncle warned everyone about this for years, and he encouraged everyone to be prepared, but you’re the only one who ever took him seriously. Now he’s your only hope. He took off for his shelter in the mountains, but he left you some supplies and a map in the shed. You just have to find those supplies before the looters do, so you can join him in safety. Can you do it? Can you get out before the looters get in? Bug Out Bunker starts at $325 for 2 hours of thrilling and unique fun. Give us a call, or send an email to find out how you can book it today!